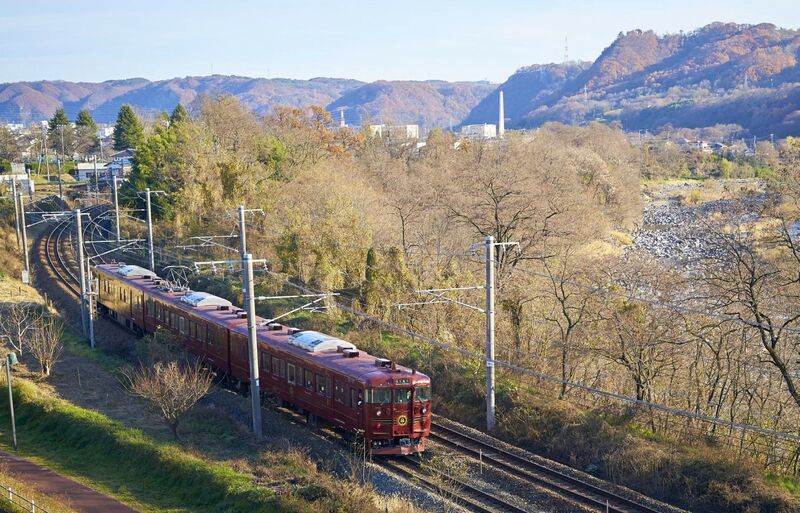 The Rokumon train takes approximately two hours to run between Karuizawa—one of Japan’s leading resort areas—and the prefectural capital of Nagano City. Inaugurated in July 2014, the train’s name comes from the Rokumonsen, the crest of the Sanada family, a warrior clan associated with Ueda City, which is on Rokumon’s route. The crest of six lined-up coins graces the body of the train, interior furnishings and even the tickets. It appears alongside other clan emblems, such as the musubi karigane (coiled goose) and the suhama sandbar. The Sanada clan’s armor and weapons also inspired the train’s striking deep-red hue. Industrial designer Eiji Mitooka, recognized for his many train designs, created this distinctive motif. In fact, Mitooka designed every detail of Rokumon, from the tickets and limited-edition souvenir packages to the Shinano Railway Karuizawa Station building, including the private Rokumon lounge. The design is noteworthy for how it carefully matches local character. For example, most of the wood used for the interior furnishings is from Nagano Prefecture: the three-car train’s first car incorporates larch, the second cedar, and the third cypress wood. The food offered on board is made by renowned local chefs, who use their talents to create inspired dishes using Shinshu produce. Rokumon offers a number of different delightful dining options, including kaiseki cuisine and a wine-pairing course. This particular trip on the Rokumon No. 1 from Karuizawa to Nagano featured a tempting Western cuisine course. As trumpeting calls from a conch shell announced the train’s departure, the station staff and children playing in the station’s kids’ area saw passengers off with beaming smiles. The drinks service begins after departure. Those who fancy making a toast should sample the local wine or cider, made from Nagano’s famous grapes and apples, respectively. Chefs aboard the train serve up the dishes, so guests can enjoy the cuisine while it is piping hot. The menu is graced with the names of many locally produced ingredients, such as prized Shinshu salmon and Tateshina beef. As you savor your meal, you’ll hear an announcement that Mount Asama is coming into view, its majestic form filling the windows. About an hour after departure the train reaches Ueda, the fifth station on the line. Here stationmaster Hikoya Sakai, clad in bright red armor, greets passengers and sees them off the train. 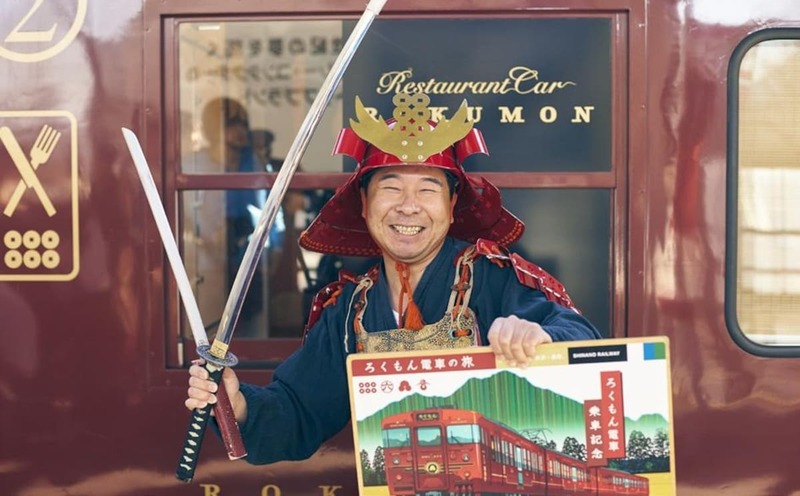 When Sakai—known as the “armored stationmaster”—announces the train’s departure with the full- throated cries of a samurai, passengers can’t help but smile. After you take in the view of Ueda Castle, the Sanada clan’s residence, and drink some Japanese tea made with water from a hot spring at the sixth station, Togura, the train soon arrives at Nagano Station. While on board and looking at the scenery from the train window, it is not unusual to see passersby waving at Rokumon. As Yamamoto says, locals clearly love this charming train. With scenery, food and regular events, a journey on the Rokumon is packed full of things for passengers to enjoy. Experience the love that the people of Shinshu have for their region and their spirit of hospitality for yourself.